MOSCOW, December 19. /TASS/. Washington is seeking a pretext for a breakup of the Intermediate-Range Nuclear Forces Treaty but it will not succeed in its attempts to apportion all blame to Moscow, Russian Deputy Foreign Minister Sergei Ryabkov said on Tuesday after the U.S. had introduced sanctions against two Russian organizations. The Foreign Ministry published his commentary at its official homepage. "It looks like the U.S. has taken the course at breaking up the INF Treaty and it is seeking a pretext," the commentary said. "But it will not succeed in apportioning blame for the situation to Russia." "We’ve called attention to the obvious encroachments on the treaty by the U.S. more than once," Ryabkov said. "Their list includes ground-based deployment - on a base in Romania - of the units capable of launching Tomahawk cruise missiles, which is strictly forbidden." "Liability for destruction of one of the pillars of the system of arms control as a result of such voluntarist actions will fall on Washington," he said. "Washington continues pinning the blame on Russia, accusing us baselessly of violations of the INF Treaty," Ryabkov went on. "We have asked the Americans many a time to provide whatever data they had to prove their groundless claims but did not happen even at last week’s meeting of the Special Monitoring Commission for the INF Treaty." "Instead, Washington announced on December 19 it was introducing sanctions against two Russian organizations," Rybkov said. "We have said on a number of occasions we are accustomed to sanctions," the commentary indicated. "The U.S. has been avidly engaged in the sanctions policy for almost four years already while the Russian economy and military strength are only growing. The illusions of a possibility of intimidating us that are harbored by a number of U.S. politicians expose their full ignorance regarding Russia and dangerous shortsightedness." 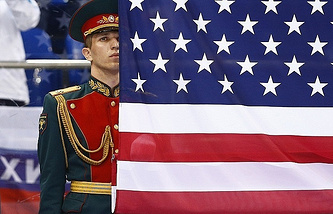 The U.S. Department of Commerce added two Russian defense companies the Novator Experimental Design Bureau and the Titan-Barrikady Federal Research & Development Center, to its blacklist. "Specifically, these entities produced, for the Russian Federation's Ministry of Defense, a ground-launched cruise-missile system, and associated transporter-erector-launcher, with a range prohibited by the Intermediate-Range Nuclear Forces Treaty," the department said in its listing. "Therefore, there is reasonable cause to believe, based on specific and articulable facts, that [the companies] have been involved in actions contrary to the national security or foreign policy," it said. Washington accused Russia of violating the INF Treaty for the first time in July 2014. At the beginning of December 2017, the Department of State said it would take measures of economic and military character unless Moscow returned to honoring its obligations in connection with the treaty. Russian Foreign Minister Sergei Lavrov told a news conference in Vienna on December 8 Washington’s charges with violation of the INF Treaty were groundless and did not deserve much attention. Along with it, Moscow makes charges of its own against Washington.